At the time, the house had not had any major renovations since the late 1980s or early 1990s. Having known and worked with Pebbles for property management and maintenance services for a number of years, the owners chose to engage Project Manager Katherine Spencer to advise on interior styling, and to organise and manage the refurbishment. As the owners were unable to get to the house regularly, Katherine visited and made arrangements over the phone, using the online Dashboard to provide a series of images, and email from time to time, to discuss ideas room by room. Through the course of this conversation, together the owners and Katherine were able to pull together a scope of works from which Pebbles provided a schedule of works, and estimates collated in to a single proposal for the refurbishment project. Starting with the ground floor, we repaired the chimney because the owners had been unable to use the wood burner since purchasing the property. We had a new wood burner fitted to comply with current regulations. We built a small walk in cupboard with hanging rails, hooks and storage for boots, coats and wetsuits as the family had no suitable storage for outdoor gear. We created a new seating area with built in bench seating (and further storage) and the area was given a nautical feel with tongue and groove cladding, feature wallpaper and a teak pilot table. We fitted a new engineered oak flooring throughout, which brightened the whole living space, and the kitchen was updated with new tiles. The property was redecorated throughout and updated light fittings where required. New curtains and blinds have been made to finish the transformation of the living areas, while upstairs the bedrooms have all been redecorated with new carpet and blinds. The master bedroom has been equipped with a freestanding bath and an updated en-suite. 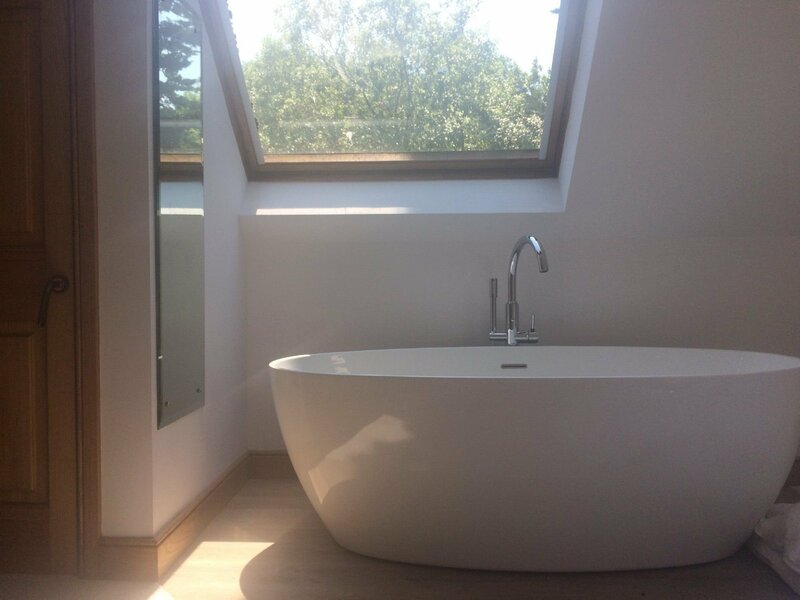 With a particularly large family, the owners had experienced a lack of hot water before the refurbishment and finding a solution for everyone to have a shower in the morning was a priority. From our select network of skilled tradespeople, Katherine worked with the plumber and carpenter we were able to to fit a larger hot water tank and install a second one on the top floor, ensuring that there will always be plenty of hot water for the family to use. We also installed an outside shower – perfect for a house next to the water like New Bridge. Work started in March and was complete in time for summer the same year. The result is a beautiful house that offers both form and function, designed for Devon life. The space looks bigger and much lighter than before, and the property fulfils the requirements of the whole family when they come to stay. “It’s AMAZING! It looks ABSOLUTELY brilliant,” say the owners, continuing: “I’m not sure I’m going to let the daughter go and stay!! Thank you so much for sorting it all out!”.